Here it is! It’s crazy to me though, after all these projects I’ve done, his room still seems a little bare. That’s okay though because i guess it’s fun to keep adding/changing it as he grows. Also, for the record, I do not consider myself in any way good at interior design. In fact, my husband pretty much chose where everything should go because he has a knack for it. I enjoy doing it though and I’m getting better so yay!! This is what is hanging on one of his walls above his changing table. I left that out of the photo though because it’s not all that glamorous. I don’t let spending money on decor that isn’t functional so that it why I went with the explorer outfit and popper gun. (plus they’re adorable!!!) My one-year-old isn’t into dressing up just yet but HE WILL BE because he looks so dang cute in that Indiana Jones hat! ($10 on amazon people! The popper gun was a lucky find at a random gas station. It really works and Cooper LOVES it. For the DIY rope clock tutorial click here! I got all of this on Amazon for a really reasonable price! His busy board is below the outfit as well. Click here for the tutorial! This is the other side of his room. I got the dinosaur designs for free from lynnspin.com. Click here for the tutorial on how to make the photo frames! Don’t look too closely at this map. I just free handed it while looking at a picture so it is most definitely not correct! Eventually we’ll be trading out the rocking chair and putting in a reading tent. These were from Grandma Kim! Cooper loves his rocking dinosaur! I keep them under the window on his third wall. I hope this gives you some ideas for your little dinosaur!! Oh how wonderful! 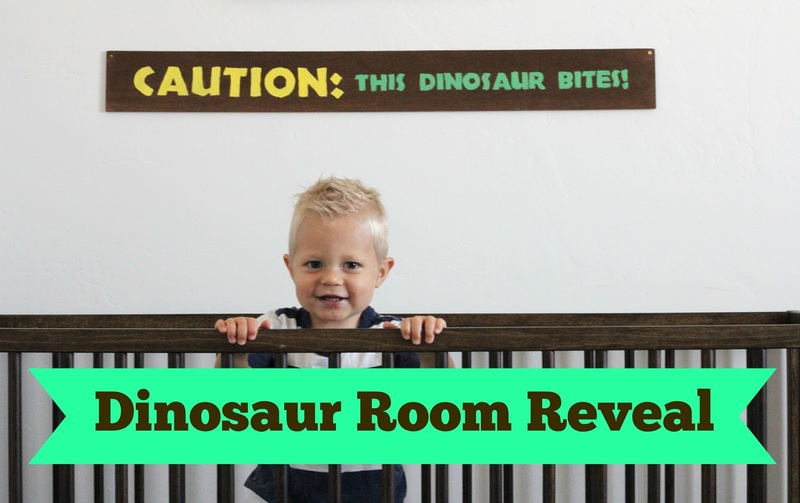 Your little dino is adorable and so is the way you've decorated his room!! This room is so cute! I love it! I didn't think of this with my little one and he had a boring white room with blue sheets lol! Such a fun dinosaur room!!! I love the Rawr sign and the map. I think you did a great job drawing the continents! Thanks so much for linking up at the Submarine Sunday Link Party! I'm loving this room!! Oh, and it's kind of kismet but I just found the picture frame tutorial on Pinterest so I can make a gift for a friend! Don't you just love that!?! 🙂 Thank you for linking up with the TGIT link party this week.